The maximum purchase quantity for this item is 1 per account/shipping address. A special Miku to commemorate the Sapporo Snow Festival! To commemorate the snow sculpture of 'Snow Miku' to be erected at the 61st Sapporo Snow Festival, comes a Nendoroid of Snow Miku! The ends of her long twin-tail hair is made from clear plastic - a first in the Nendoroid world! 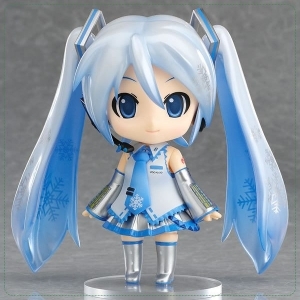 The snowflakes printed into her hair, and ice blue outfit with parts coated with a glimmering silver coating really give a feeling of a snowy Winter for an all new appearance of Miku - one that almost looks as it it will melt away if you hold her in your hands. 넨도로이드 세이버/아서 펜드래건 DX 영기재림 ver.